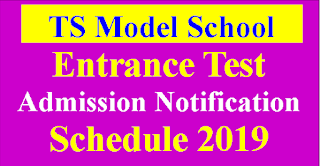 TS Model Schools Entrance Exam 2019 Notification Released on 21/01/2019. TS Model School Online Application From 28/01/2019 to 08/03/2019. 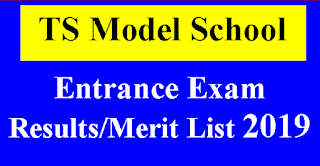 TS Model School Entrance Exam Will Be Held on 13/04/2019 And You Can Download TS Model School Entrance Exam Hall Tickets From 09/04/2019 to 12/04/2019.Results Will be Released on 18/05/2019. 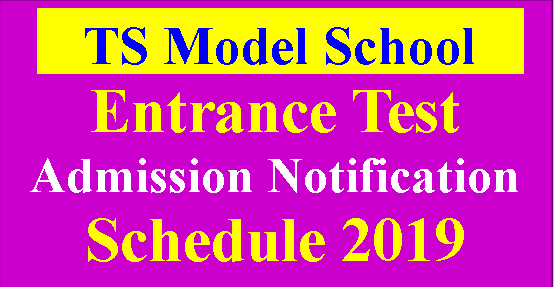 TS Model School Entrance Exam Selection List will be Released on 27/05/2019. Governmentana director of school education released Admission Notification for 2019. Entrance Test for admission in VI class and For vacant seat of VII to X classes in Telangana State Model School(TSMS) for The Academic Year 2019-20. Download the Application Format from 21-01-2019 onwards. The list of Model Schools and application formats are kept in website http://telanganams.cgg.gov.in/ and download the same. iv. 33.33% seats shall be reserved for Girls in all categories as indicated in Clause 4(vii). v. If sufficient number of candidates of any particular category are not available to fill up the seats reserved for that group, they may be filled up by suitable candidates as indicated in Clause 4(x) of G.O. 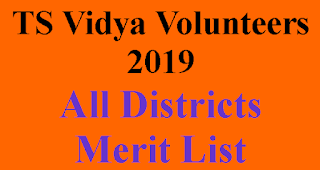 If merit marks are equal in case of more than one student income of the parent will be taken in to consideration and seat will be allotted to the student whose parental income is low. Submission of wrong online information will lead to cancellation of admission without any notice. Caste and Date of Birth Certificates should be submitted to the Principal at the time of admission. Keep pass port size photo readily with them. Utmost care should be taken while filling the online application.